Southpaw Bar & Sushi at Jalan Besar is a modern Cali-styled sushi bar, pairing food with whiskey, instead of with sake as is traditionally done. (They have sake too. To be clear, Japanese are big whiskey drinkers, and so this whiskey-sushi pairing isn’t farfetched.) Because Southpaw is not a traditional sushi-ya, it didn’t adopt a Japanese shop name. If you’ve watched the Jake Gyllenhaal movie, you’d know “southpaw” refers to a left-handed boxer; left-handedness is considered an abomination in Christianity but in boxing, it gives the fighter the advantage of surprise element. And surprisingly good is Southpaw Sushi. The sushi joint is a small establishment with only 12 seats (so make reservations and show up). It’s helmed by Chef Kenny Khoo with 17 years of experience at esteemed Japanese restaurants such as Nogawa, the very first sushi restaurant in Singapore opened in 1978, and Tatsuya at Goodwood Park Hotel. It’s a small operations with only Khoo and a server and they might be busy when it gets crowded. 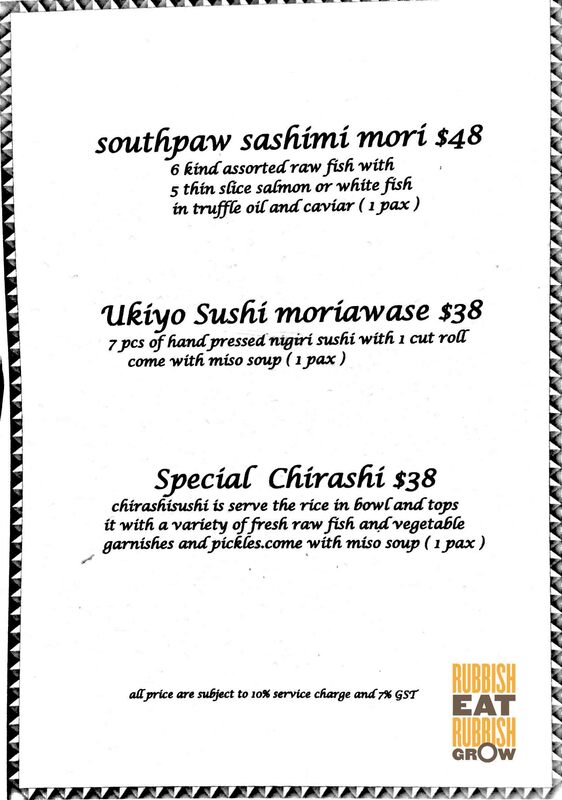 Southpaw is only open for dinner, serving omakase sets at $68+, $98+, and $138+. 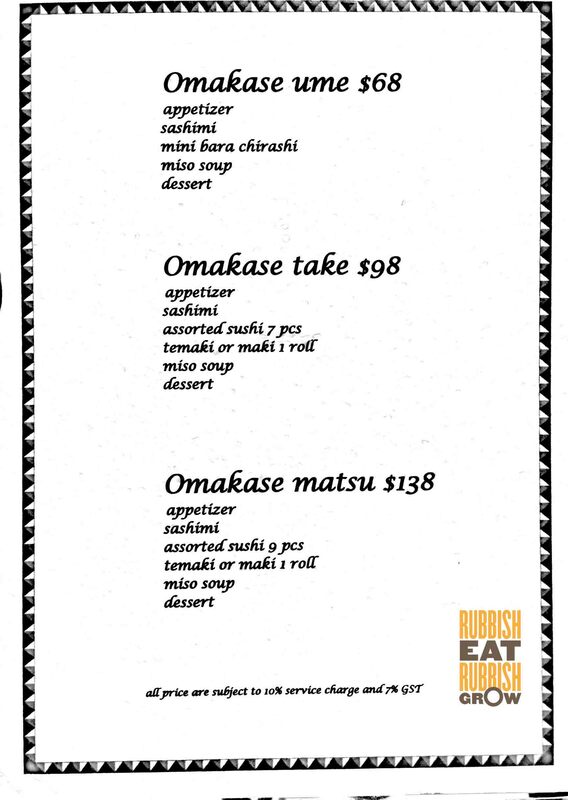 If you find it costly, they have a 7 piece sushi set for $38 and a chirashi don for also $38. As for whiskey, they have rare and limited bottles of whiskey. Roy Ng the owner is a whiskey connoisseur who collects rare bottles, some as rare as only having 150 bottles in the world. The first course is a gorgeous, gigantic Canadian Rock oyster, luminous and white like a half moon. Here, a touch of whiskey (The Ten #3 Light Highland) is sprinkled on the oyster. The burning sensation of the whiskey hits you first; there is a certain floral smokiness. Then the incredible flavor of oyster, as if tasting the sea, lingers in the mouth. The second course: thin slices of salmon are topped with caviar, truffle oil, and bonito flakes. If you wonder why the bonito looks different, it’s because they have been fried together with secret ingredients. It’s a nice dish, but I thought it’s a little gimmicky with truffle oil. The extremely thick slices of sashimi come next. There is a certain skill in mixing-and-matching sashimi so that the flavors are balanced and the different seafood don’t compete with one and another. And here, the sashimi gives a good variation of tastes. One special piece stood out for us, the white tuna, which is lightly toasted. I’ve eaten white tuna before at Manzoku, and both times I was taken aback by their richness. We enter the 7 types of sushi and this is where you can tell the difference between a traditional sushi house and Southpaw, which adds ingredients to the sushi. The iku (squid), for instance, is seasoned with rock salt and lemon. Maguro (tuna) has a drop of mountain yam. Special mention: the akagai (clam) is especially good here; it’s slightly crunchy, a texture seldom found in akagai. Our favorite sushi, which brought tears to our eyes, is the foie gras scallop sushi (below). The foie gras is torched so that some oil falls onto the scallop and the rice. It’s rich, bursting with umami, and yet after the initial robustness of the foie gras, the gentle sweetness of scallops comes through. The seafood here is firm and flavorful; high quality. However, the shari (rice) needs some improvement. Good sushi has a contrast of temperature of warm rice and cool seafood, like the negitoro maki here, whose seaweed is lightly toasted to give it a gentle heat. To preserve the warmth of shari, I’ve seen many sushi chefs keep the rice in wooden buckets. But Khoo scoops out shari onto a bowl and then moulds the rice into sushi. As a result, the rice is not warm and loses some moisture. On the whole, we enjoyed ourselves very much. It is a cozy, almost homely environment; we were served by sincere and dedicated staff; the food was good; and the whiskey warmed our stomachs. What else can anyone ask for?